Rome Monument custom designs and manufactures matching bronze U.S. military veterans (VA) grave markers and headstones. Rome Monument sells headstones for veterans that are not eligible for a free grave marker. These "replica" memorials are normally ordered by veteran's spouses or family members. These bronze markers are designed to match, or be similar to, an existing veteran's grave marker in a cemetery. These cost $595.00. See the example picture above. Anchor bolts, nuts and washers for fastening to a base are furnished with the marker. 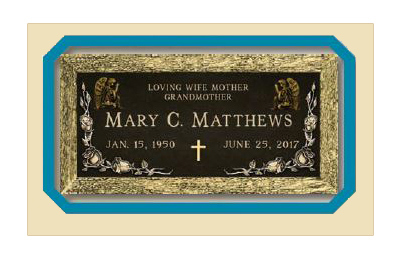 These bronze plaques can also be mounted on a granite base. These are sold for $950.00. See the example picture below. To place your order and get additional information, call 724-770-0100 and ask for Vince Dioguardi or Chris Morgan. You can also email info@romemonuments.com to place your order. To ensure exact duplication please e‐mail info@romemonuments.com a photo of the bronze veterans marker you want to duplicate. 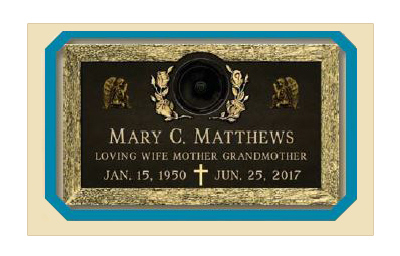 Four (4) Words of endearment such as "Beloved Wife, Mother, Grandmother"
Once Rome Monument receives your picture and bronze marker design and inscription details, we will use a CAD program to design a drawing. Rome Monument will e‐mail you a drawing of the matching bronze memorial design for you to review. 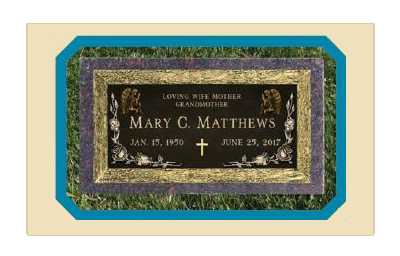 Once you receive the drawing, we strongly suggest that you show the design drawing to the cemetery administrator to ensure that the bronze marker you are ordering will meet the cemetery requirements. Once your cemetery administrator and you approve the design drawing, you can place your order. If your cemetery administrator or you need the drawing revised, please email info@romemonuments.com or call 724-770-0100 to let us know what components of the design need to be modified. If you are pleased with the drawing and want to place the order, email us a signed copy of the drawing to info@romemonuments.com, fax it to 724-770-9835 or mail it to Rome Monument, P.O. Box 106 Rochester, PA 15074. Please provide us with your phone number and shipping address in your email, fax or USPS mail correspondence. Please let us know if we are shipping this to a residence or business in your email, fax or USPS mail correspondence. You have 3 payment options. You can make your payment by PayPal by clicking on the PayPal button on this website, pay by credit card over the phone by calling 724-770-0100 or mail a check payable to Rome Monument, P.O. Box 106 Rochester, PA 15074. Your matching bronze veteran's grave marker will arrive at your designated delivery address within 6 weeks. Prices start at $595.00. Call 724-770-0100 and ask for Vince Dioguardi or Chris Morgan for information and to order. You can also email info@romemonuments.com. Rome Monument can include available emblems of belief for placement on duplicates of government headstones and markers. We suggest that you e-mail us a picture of the memorial you are trying to match. Rome Monument specializes in designing, manufacturing and delivering headstones, markers and monuments that designate the resting place of a veteran who served in our Armed Forces. These can complement or take the place of a government-issued headstone. Because the US Government (VA) cannot issue a headstone or marker for a spouse or dependent buried in a private cemetery, Rome Monument sells these bronze military grave markers. Military headstone inscriptions frequently include abbreviations that denote the branch of service, war service and awards. The ranks included the Air Force, Army, Army Air Corps, Army Air Forces, Coast Guard, Marine Corps, Merchant Marines and Navy. Click here for a list of the most commonly inscribed abbreviations placed on Government-furnished headstones and markers. Browse the pictures here to see examples of military headstone inscriptions, military headstone designs, military headstone abbreviations, military headstone symbols and military headstone quotes. The Department of Veterans Affairs' (VA) National Cemetery Administration maintains 136 national cemeteries in 40 states (and Puerto Rico) as well as 33 soldier's lots and monument sites. Click here for a list of national cemeteries maintained by the VA.
Rome Monument also sells veterans grave markers to members of the United States Armed Forces who do not want to go through the process of ordering a free headstone from the government. 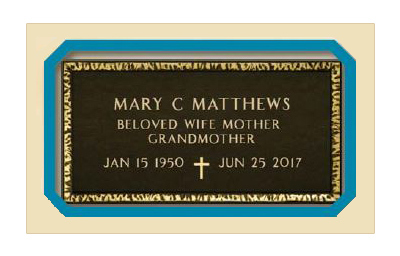 These bronze, granite, or bronze and granite grave markers are typically designed to copy or duplicate the style provided by the United States Department of Veterans Affairs (VA). We also design unique cemetery monuments that incorporate military and armed forces themes, emblems and symbolism. You can order a bronze or granite grave marker that matches the design of veteran's grave marker or U.S. Military headstone for a veteran, spouse or dependent. All bronze veterans memorials that we design and create are produced at the Bronze Division of Matthews International Corporation (Matthews Resources, Inc.). Matthews Bronze is the same foundry that creates the bronze markers provided to veterans. This leader in cemetery products is the oldest and most reputable bronze producer in the United States. They set the benchmark in bronze memorialization and commemorative plaques. Over the years, they have manufactured famous works such as Elvis Presley’s memorial at Graceland and the plaques at the Baseball Hall of Fame in Cooperstown, New York. To place your order, call 724-770-0100 and ask for Vince Dioguardi or Chris Morgan. You can also email info@romemonuments.com. 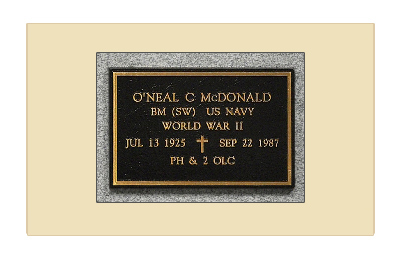 Click here to see an example of a U.S. Navy Veterans Bronze Grave Marker. Click here to see an example of a U.S. Army Military Veterans Bronze Headstone. 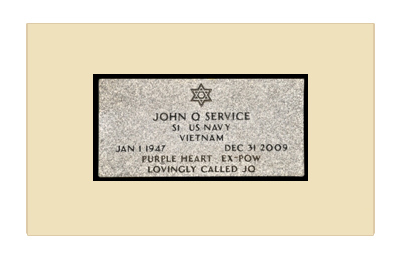 Click here to see an example of a Veteran And Spouse Bronze Companion Flat Headstone Memorial. Click here to see an example of a bronze military headstone for a veteran and his spouse. The two matching bronze plaques are mounted on one piece of granite. Click here to see an example of a bronze veterans niche grave marker. Click here to see an example of an upright granite monument that honors a veteran of the United States Air Force. Click here to see an example of an upright double (companion) monument with an etched Marine Corps emblem. Click here to see an example of a custom monument designed for a U.S. Navy Veteran. 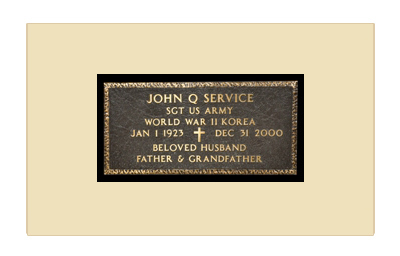 Click here to see an example of a Flat Granite Headstone For U.S. Army WW II Veteran. Because matching, or companion, veterans headstones and markers for eligible spouses and dependents are not provided by The Department of Veterans Affairs (VA), unless they are buried in a national cemetery, state Veteran's cemetery, or military post/base cemetery, Rome Monument manufactures exact duplicates of U.S. government-furnished headstones and markers. Bronze Size 24” x 14” Granite: 28” x 18” x 4” add $425. Click here to see an example of a veterans bronze headstone marker attached to a mahogany granite surround. Extra words of endearment can be added for $20.00 per word. Extra standard emblems can be added for $150.00 per emblem. Colored porcelain ceramic cameos backed by stainless steel can be added for $225.00 (please note a ring is needed for the photo and will count as a standard emblem). The flat bronze grave marker, pictured above, is 24 inches long, 12 inches wide, with 3/4 inch rise. The weight is approximately 18 pounds. Anchor bolts, nuts and washers for fastening to a base are furnished with the marker. The government does not furnish a base. Pictured above is an example of a flat bronze veterans grave marker provided by the United States government. Pictured below is an example of a flat granite grave marker provided by the United States government. It is 24 inches long, 12 inches wide, and 4 inches thick. Weight is approximately 130 pounds. Rome Monument designs exact copies, replicas and duplicates of these types of flat bronze and granite veterans grave markers and headstones. Pictured below is a bronze niche marker that is used to mark a columbaria or a mausoleum niche used for the inurnment of cremated remains of a veteran. This niche marker is 8 1/2 inches long, 5 1/2 inches wide, with a 7/16 inch rise. The weight is approximately 3 pounds; mounting bolts and washers are furnished with the marker. Rome Monument designs and sells these type of bronze niche markers. Click here to see an example of a bronze niche marker manufactured by Rome Monument. 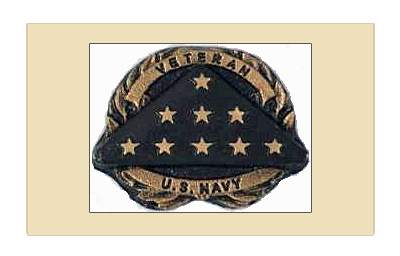 The Department of Veterans Affairs provides medallions (pictured above) which are attached to an existing, privately purchased headstone or grave marker to signify the deceased's status as a Veteran. The medallion is furnished in lieu of a traditional Government headstone or grave marker for those Veterans who served on or after Apr. 6, 1917 and whose grave in a private cemetery is marked with a privately purchased headstone or marker. Three sizes of medallions are available: Large (6-3/8”W x 4-3/4”H x 1/2”D), Medium (3-3/4”W x 2-7/8”H x 1/4"D) and Small (2”W x 1-1/2”H x 1/3”D). Each medallion is inscribed with the word “VETERAN” across the top and the branch of service at the bottom. Rome Monument specializes in designing, manufacturing and installing Armed Forces, Veterans and military memorials for public spaces such as city parks and government building properties. These memorials commemorate the achievements of an important local public figure or group of people who served our country faithfully in the Army, Navy, Marines, Air Force, or Coast Guard. They may also commemorate an important military event that has special meaning to the community. Sculpted or inscribed with beautiful etchings, engravings, and photographs, custom designed Armed Forces and military memorials come in a variety of styles, shapes, and granite colors in different price ranges to fit your needs and budget. To view pictures of example armed forces and military memorial designs, click here. Rome monument designed a bronze veterans headstone memorial on mahogany granite to honor Roy E Winkle, a veteran of the US Navy and commissioned on the USS Saratoga in the Vietnam War. This bronze flat grave marker is installed at Sylvania Hills Memorial Park in Rochester, Pennsylvania. Rome Monument can incorporate any available emblem of belief or military grave marker symbol into the design of a veterans grave marker or headstone.